CarPro's Soap Gel has under gone some major changes! It is now known as CarPro Snow Soap and can be used with multiple wash methods, including as a snow foam, or as it was previously used, applied directly to your mitt. After a vehicle has been properly de-contaminated IXSS will keep it free of iron particles far more than any other car wash. If the vehicle has been previously coated with Cquartz or CQuartz UK, Snow Soap is a perfect match for maintenance. Clean your car and remove iron particles at the same time! 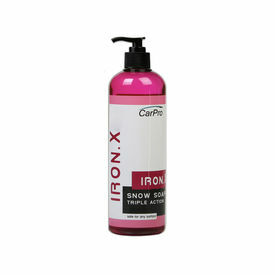 Iron X Snow Soap has been adapted to be used as a dedicated Snow Foam or as a direct to mitt wash, while maintaining its fallout removal abilities. Per car it will consume 400ml neat with foam lancer with a fully closed lancer valve. That dilustion is for working on iron. As you know a power washer with the foam lancer sprays lots of water which means a high dilution while spraying. This is why why we recommend it neat with foam lancer if you want the IXSS to react on iron. Rinse your car well using power wash to remove dust & contaminants. You will notice the soap gel changing color where it encounters iron. This indicates fallout removal and highlights the areas of concern where you may wish to follow up with either Iron X paste or liquid, later on in the decontamination process. While small iron particals will be removed by IXSS larger particles or vehicles that have not been thoroughly decontaminated previously will require the higher concentrated Iron X or Iron X Paste. IronX Snow Soap will affect oil base waxes by approximately 50%. Do not use as a mainenance wash unless you are decontaminating your vehicle or it has been protected with a durable sealant or a coating (such as Cquartz, or CQuartz UK). Avoid using on fabric convertible tops.